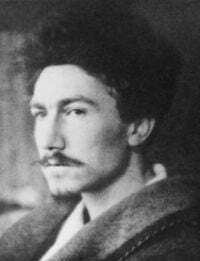 Ezra Pound, one of the most influential Imagists. Imagism was a movement in early twentieth century Anglo–American poetry that favored precision of imagery, and clear, sharp language, as opposed to decorous language and unnecessary meter and rhyme. The Imagists rejected the sentiment and artifice typical of much Romantic and Victorian poetry. This was in contrast to their contemporaries, the Georgian poets, who were by and large content to work within that tradition. Group publication of work under the Imagist name in magazines and in four anthologies, appearing between 1914 and 1917, featured writing by many of the most significant figures in Modernist poetry in English, as well as a number of other Modernist figures who were to be prominent in fields other than poetry. Based in London, the Imagists were drawn from Britain, Ireland, and the United States. Though somewhat unusual for the time, the Imagists featured a significant number of women writers amongst their major figures. Historically, Imagism is also significant because it was the first organized Modernist literary movement or group in the history of English literature. In the words of T.S. Eliot; "The point de repère usually and conveniently taken as the starting-point of modern poetry is the group denominated 'imagists' (sic) in London about 1910." At the time Imagism emerged, Henry Wadsworth Longfellow and Alfred Lord Tennyson were considered the paragons for poetry, and the public valued the moralizing and didactic tone of their writings. In contrast, Imagism called for a return to what were seen as more Classical values, such as directness of presentation, economy of language, and a willingness to experiment with non-traditional verse forms. The focus on the "thing in itself" (an attempt at isolating a single image to reveal its essence) also mirrors contemporary developments in avant-garde art, particularly Cubism. Although the Imagists as a cohesive group only existed for a very brief time, the legacy of Imagism to American and English-language poetry is immense. Imagism is generally credited with opening the field of English-language verse, allowing new and experimental styles of poetry to flourish. The Georgian Poets, whom the Imagists opposed, are almost entirely discredited today, and virtually all English-language poetry of the twentieth century can trace its influence back to the seminal work of the Imagists. During the first ten years of the twentieth century, while Alfred Austin was the serving British Poet Laureate, poetry had a large audience. Volumes of verse published during the decade include Thomas Hardy's The Dynasts, Christina Rossetti's posthumous Poetical Works, Ernest Dowson's Poems, George Meredith's Last Poemsm, Robert W. Service's Ballads of a Cheechako, and John Masefield's Ballads and Poems. Future Nobel Prize for Literature winner, William Butler Yeats, was devoting much of his energy to the Abbey Theater and writing for the stage, producing relatively little lyric poetry during this period. In 1907, the Nobel Prize for Literature was awarded to Rudyard Kipling. In general, the poetry of the period was formally traditionalist and decorous in content. These literary figures and values provided the context that Imagists emerged in as a self-consciously avant-garde movement. The origins of Imagism are to be found in two poems, "Autumn" and "A City Sunset" by T. E. Hulme. These were published in January 1909, by the Poets' Club in London, in a booklet called For Christmas MDCCCCVIII. Hulme was a student of mathematics and philosophy; he had been involved in the setting up of the Club in 1908, and was its first secretary. Around the end of 1908, he presented his paper, A Lecture on Modern Poetry, at one of the Club's meetings. Writing in A. R. Orage's magazine, The New Age, the poet and critic F. S. Flint (a champion of free verse and modern French poetry) was highly critical of the club and its publications. From the ensuing debate, Hulme and Flint became close friends. In 1909, Hulme left the Poets' Club, and started meeting with Flint and other poets in a new group, which Hulme referred to as the "Secession Club;" they met at the Eiffel Tower restaurant in Soho to discuss plans to reform contemporary poetry through the elimination of all excessive verbiage, and the use of forms such as free verse and the tanka and haiku. In April 1909, the American poet Ezra Pound was introduced to this group and found that their ideas were close to his own. In particular, Pound's studies of Romance literature had led him to an admiration of the condensed, direct expression that he detected in the writings of Arnaut Daniel, Dante, and Guido Cavalcanti, among others. For example, in his 1911/12 series of essays I Gather the Limbs of Osiris, Pound writes of Daniel's line "pensar de lieis m'es repaus" ("it rests me to think of her") (from the canzone En breu brizara'l temps braus): "You cannot get statement simpler than that, or clearer, or less rhetorical." These criteria of directness, clarity, and lack of rhetoric were to be amongst the defining qualities of Imagist poetry. In a 1928 letter to the French critic and translator René Taupin, Pound was keen to emphasize another ancestry for Imagism, pointing out that Hulme was, in many ways, indebted to the Symbolist tradition, linking back via W. B. Yeats, Arthur Symons, and the 1890s generation of British poets to Mallarmé. In 1915, for instance, Pound edited the poetry of another British 1890s poet, Lionel Johnson, in the introduction which, he wrote, "no one has written purer Imagisme than [Johnson] has, in the line 'Clear lie the fields, and fade into blue air.' It has a beauty like the Chinese." In 1911, Pound introduced two other poets to the Eiffel Tower group, his ex-fiancée Hilda Doolittle (who had started signing her work H.D.) and her future husband, Richard Aldington. These two were interested in exploring Greek poetic models, especially Sappho, an interest that Pound shared. The compression of expression that they achieved by following the Greek example complemented the proto-Imagist interest in Japanese poetry, and, in 1912, during a meeting in the British Museum tea room, Pound told H.D. and Aldington that they were Imagistes, and even appended the signature H.D. Imagiste to some poems they were discussing. When Harriet Monroe started her Poetry magazine in 1911, she had asked Pound to act as foreign editor. In October 1912, he submitted three poems, each by H.D. and Aldington, under the Imagiste rubric. Aldington's poems, "Choricos." "To a Greek Marble," and "Au Vieux Jadrin," were in the November issue of Poetry and H.D. 's, "Hermes of the Ways," "Orchard," and "Epigram," appeared in the January 1913 issue; Imagism as a movement was launched. The April issue published what remains one of the most striking and influential of Imagist works, the incredibly brief, haiku-like poem of Ezra Pound entitled "In a Station of the Metro:"
Direct treatment of the "thing," whether subjective or objective. Pound's note opened with a definition of an image as "that which presents an intellectual and emotional complex in an instant of time." Pound goes on to state that It is better to present one Image in a lifetime than to produce voluminous works. His list of don'ts reinforced Flint's three statements, while warning that they should not be considered as dogma but as the "result of long contemplation." Taken together, these two texts comprised the Imagist program for a return to what they saw as the best poetic practice of the past. Determined to promote the work of the Imagists, and particularly of Aldington and H.D., Pound decided to publish an anthology under the title, Des Imagistes. This was published in 1914, by the Poetry Bookshop in London. In addition to ten poems by Aldington, seven by H.D., and six by Pound, the book included work by Flint, Skipwith Cannell, Amy Lowell, William Carlos Williams, James Joyce, Ford Madox Ford, Allen Upward, and John Cournos. Pound's editorial choices were based on what he saw as the degree of sympathy that these writers displayed with Imagist precepts, rather than active participation in a group as such. Williams, who was based in the United States, had not participated in any of the discussions of the Eiffel Tower group. However, he and Pound had long been corresponding on the question of the renewal of poetry along similar lines. Ford was included at least partly because of his strong influence on Pound as the younger poet made the transition from his earlier, Pre-Raphaelite-influenced, style towards a harder, more modern way of writing. The following year, Pound and Flint fell out over their different interpretations of the history and goals of the group, arising from an article on the history of Imagism written by Flint and published in The Egoist, in May 1915. Flint was at pains to emphasize the contribution of the Eiffel Tower poets, especially Storer. Pound believed that the "Hellenic hardness" in the poems of H.D. and Aldington would be diluted by the "custard" of Storer, and after the falling-out, Pound would divorce himself from the Imagist movement. Pound went on instead to co-found the Vorticists with his friend, the painter and writer Wyndham Lewis. Around this time, the American Imagist Amy Lowell moved to London, determined to promote her own work and that of the other Imagist poets. Lowell was an enthusiastic champion of literary experiment who was willing to use her money to publish the group. Lowell was determined to change the method of selection from Pound's autocratic editorial attitude to a more democratic manner. This new editorial policy was stated in the Preface to the first anthology to appear under her leadership: "In this new book we have followed a slightly different arrangement to that of our former Anthology. Instead of an arbitrary selection by an editor, each poet has been permitted to represent himself by the work he considers his best, the only stipulation being that it should not yet have appeared in book form." The outcome was a series of Imagist anthologies under the title, Some Imagist Poets. The first of these appeared in 1915, planned and assembled mainly by H.D. and Aldington. Two further issues, both edited by Lowell, were published in 1916 and 1917. Lowell persuaded D. H. Lawrence to contribute poems to the 1915 and 1916, volumes, making him the only writer to publish as both a Georgian poet and an Imagist. Marianne Moore also became associated with the group during this period. However, with World War I as a backdrop, the times were not easy for avant-garde literary movements (Aldington, for example, spent much of the war at the front), and the 1917 anthology effectively marked the end of the Imagists as a movement. In 1929, Walter Lowenfels jokingly suggested that Aldington should produce a new Imagist anthology. Aldington, by now a successful novelist, took up the suggestion and enlisted the help of Ford and H.D. The result was the Imagist Anthology 1930, edited by Aldington and including all the contributors to the four earlier anthologies with the exception of Lowell, who had died, Cannell, who had disappeared, and Pound, who declined. The appearance of this anthology initiated a critical discussion of the place of the Imagists in the history of twentieth century poetry. Of the poets who were published in the various Imagist anthologies, Joyce, Lawrence, and Aldington are now primarily remembered and read as novelists. Marianne Moore, who was at most a fringe member of the group, carved out a unique poetic style of her own that retained an Imagist concern with compression of language. William Carlos Williams developed his poetics along distinctly American lines with his variable foot and a diction he claimed was taken from "the mouths of Polish mothers." Both Pound and H.D. turned to writing long poems, but retained much of the hard edge to their language as an Imagist legacy. Most of the other members of the group are largely forgotten except for their contributions to the history of Imagism. Despite being so short-lived as a movement, Imagism was to prove to be deeply influential on the course of modernist poetry in English. Aldington, in his 1941 memoir, writes: "I think the poems of Ezra Pound, D.H. Lawrence, and Ford Madox Ford will continue to be read. And to a considerable extent T. S. Eliot and his followers have carried on their operations from positions won by the Imagists." Wallace Stevens, on the other hand, voiced his views on the shortcomings in the Imagist approach; he wrote, "Not all objects are equal. The vice of imagism was that it did not recognize this." The influence of Imagism can be seen clearly in the work of the Objectivist poets, who came to prominence in the 1930s, under the auspices of Pound and Williams. The Objectivists worked mainly in free verse. Clearly linking Objectivism's principles with Imagism's, Louis Zukofsky insisted, in his introduction to the 1931 Objectivist issue of Poetry, on writing "which is the detail, not mirage, of seeing, of thinking with the things as they exist, and of directing them along a line of melody." The influence of Imagism can be seen in a number of 1950s poetic groups and movements, especially the Beat generation, the Black Mountain poets, and others associated with the San Francisco Renaissance. In his seminal 1950 essay, Projective Verse, Charles Olson, the theorist of the Black Mountain group, wrote "ONE PERCEPTION MUST IMMEDIATELY AND DIRECTLY LEAD TO A FURTHER PERCEPTION," a credo that derives directly from the Imagists. Among the Beats, Gary Snyder and Allen Ginsberg, in particular, were influenced by the Imagist emphasis on Chinese and Japanese poetry. William Carlos Williams was another who had a strong impact on the Beat poets, encouraging poets like Lew Welch and writing an introduction for the book publication of Ginsberg's Howl. One poet associated with the Objectivist group, Louis Zukofsky, was a major influence on the Language poets, who carried the Imagist focus on formal concerns to a high level of development. Aldington, Richard. Life For Life's Sake. The Viking Press, 1941. Jones, Peter, ed. Imagist Poetry. Penguin, 1972. All links retrieved February 25, 2018. Bibliography of Japan in English-Language Verse. This page was last modified on 26 February 2018, at 00:22.